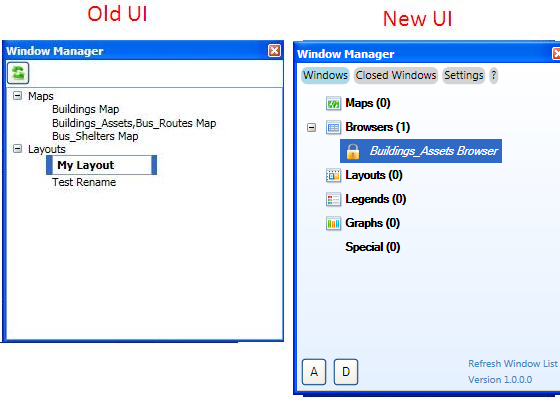 MapInfo Window Manager Version 1 – Coming Soon! 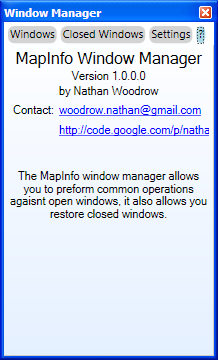 Since the release of version 0.5 of my MapInfo Window Manager I have been working on the new version which will be Version 1.0 and to be released soon. It has some new features, bug fixes and a improved UI. Double click to bring window to the front. F2 turns on rename function for the selected window. Groups can be sorted individually. 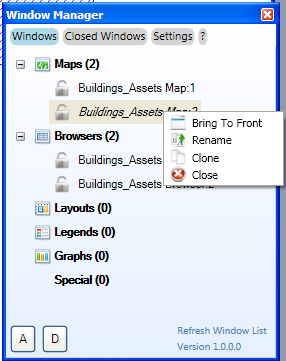 All windows can be cloned except for Special windows. Shows count of windows open in each group. Windows can be locked to stop accidental closing. Credit to Peter Horsboll Moller of PBBI MapInfo for this idea, which came from his MapBasic Window Helper tool. Double click to reopen window. 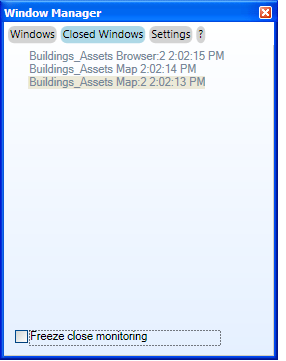 Allows the program to be auto loaded and the tool to be shown when MapInfo loads. 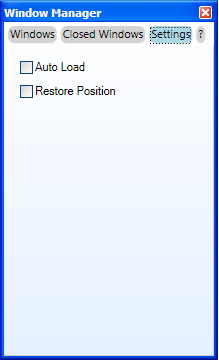 Allows the program to store the position of itself. I have been testing my Window Manager at home and at work, I use it almost everyday, and with some people that I know. However I would like to get some more testing done by some other people to make sure that Version 1.0 is good and stable. I am also still look out for anymore ideas that I could throw into Version 1.0. Previous Post Unofficial MapInfo feature request list – Updated Again!